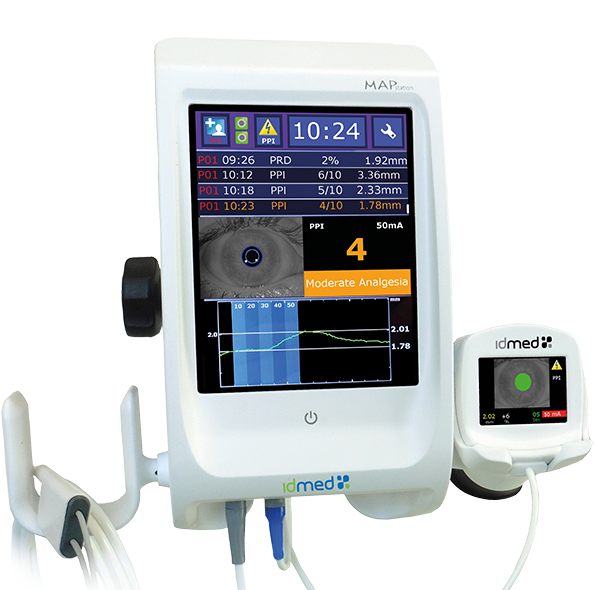 IDMED, a French company based in Marseille, develops and markets innovative medical devices in the fields of anesthesia and intensive care. Our products are used worldwide in operating theaters, intensive care units, neuro-ophthalmological consultations and research laboratories. Our products are commonly used in the areas of pupillometry, neuromuscular blockade monitoring and analgesia monitoring. 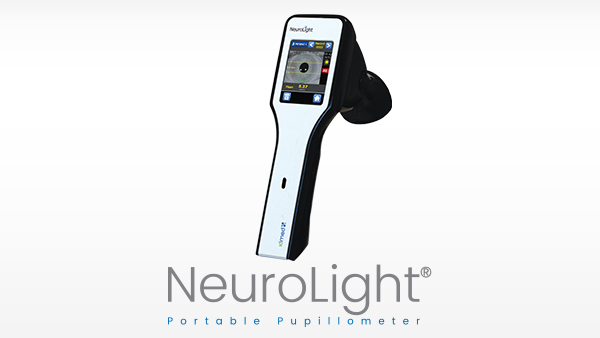 The NeuroLight® provides accurate and reliable pupil size and reactivity measurement of patient’s to fine tune the neurological diagnostic in Intensive care units. 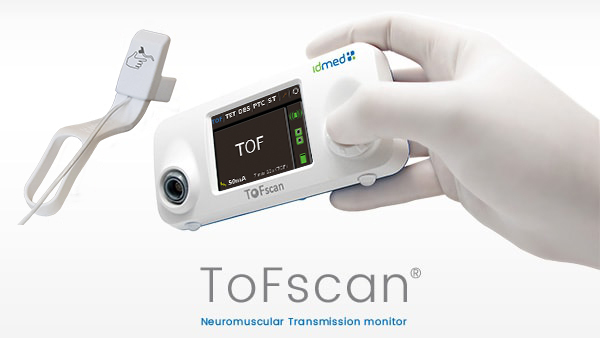 ToFscan® is a Neuromuscular Blockade Monitor using three-dimensional sensors. No calibration required before use. 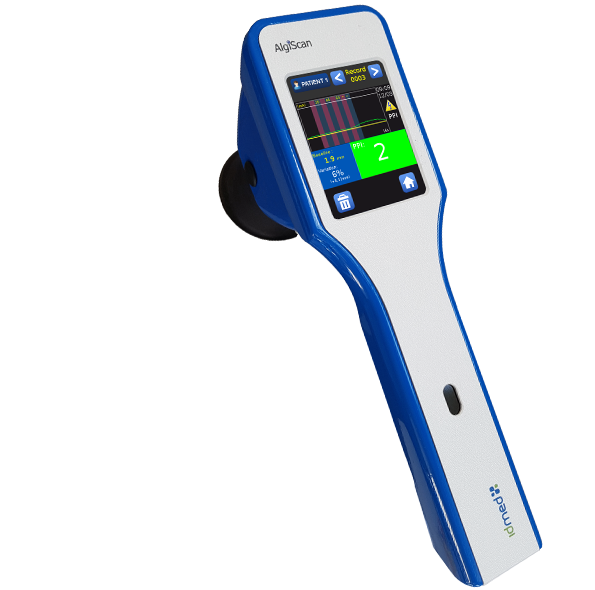 The AlgiScan® and the MAPstation® utilise pupillometry technique for the measurement of the pupillary dilation reflex which indicate the patient’s level of analgesia to the anesthetist. IDMED develops products in collaboration with healthcare professionals. Innovation, reliability and relevance are the core qualities of our devices. We put our technical knowledge to the service of an improved everyday clinical practice. 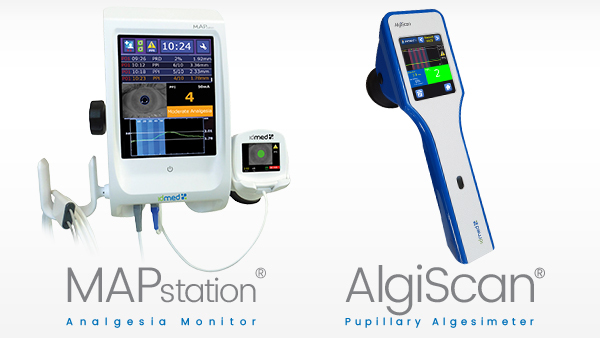 The MAPstation (Operating Theater) and the AlgiScan (ICU) are non invasive monitoring systems which provide the patient’s analgesia level in a few seconds. 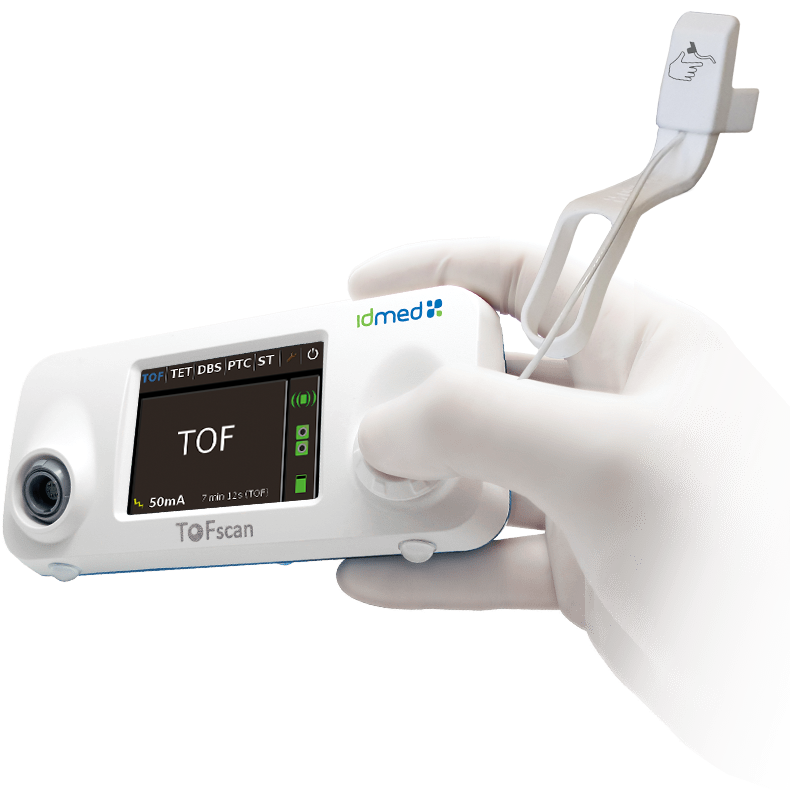 The ToFscan is designed to monitor the patient’s level of neuromuscular blockade and recovery with accuracy and objectivity. 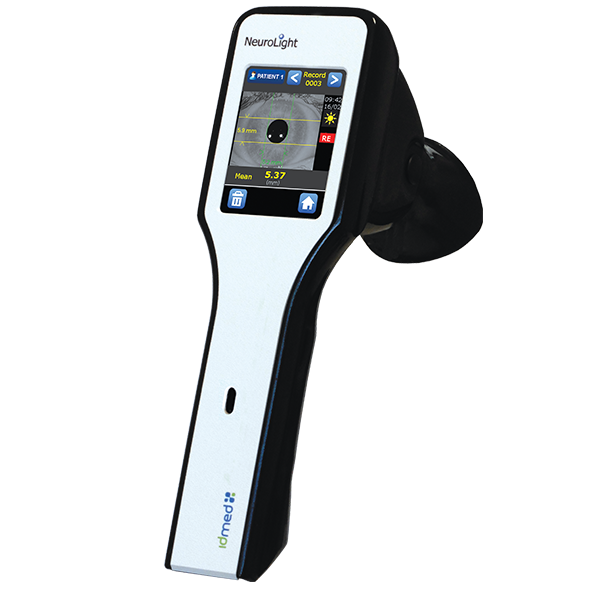 The NeuroLight offers an accurate and reproducible way to measure the patient’s pupil size and reactivity providing a fine-tuned analysis of the photomotor reflex. 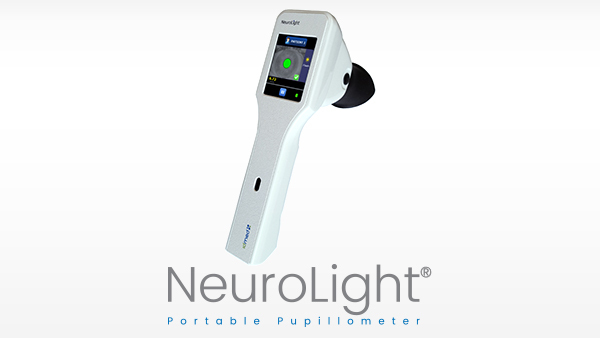 In ophthalmology, the NeuroLight is designed to characterize the pupil’s shape and analyze its reactivity to flashes of light. 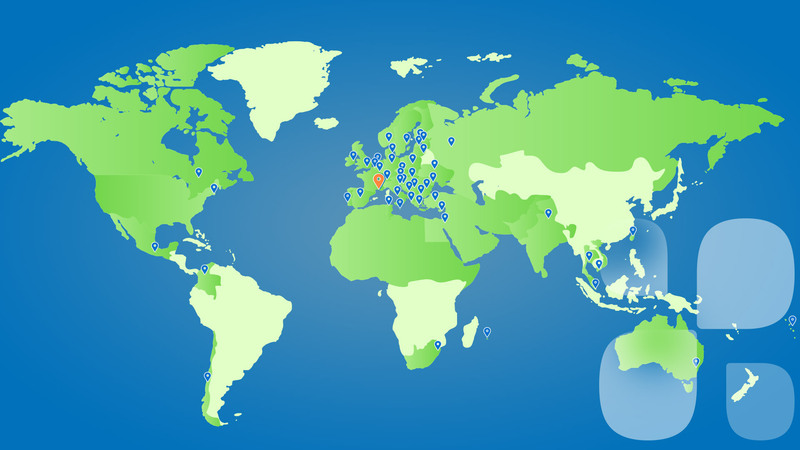 Our products are available worldwide. Our employees and distributors are at your service to meet your needs and the needs of your patients. "Pupillary reflex dilation in response to incremental nociceptive stimuli in patients receiving intravenous ketamine." 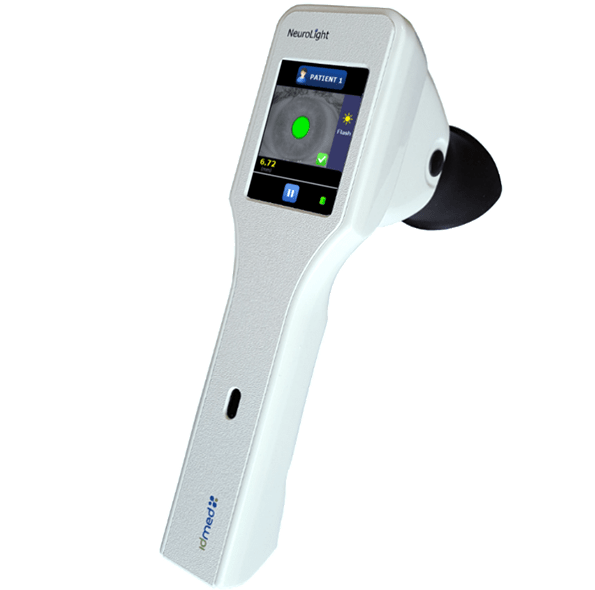 Sabourdin N, Giral T, Wolk R, Louvet N, Constant I.
Pupillometry is a non-invasive monitoring technique, which allows dynamic pupillary diameter measurement by an infrared camera. Pupillary diameter increases in response to nociceptive stimuli. In patients anesthetized with propofol or volatile agents, the magnitude of this pupillary dilation is related to the intensity of the stimulus. Pupillary response to nociceptive stimuli has never been studied under ketamine anesthesia. Our objective was to describe pupillary reflex dilation after calibrated tetanic stimulations in patients receiving intravenous ketamine. After written consent, 24 patients of our pediatric burn care unit were included. J Clin Monit Comput. 2017 Oct 17. doi: 10.1007/s10877-017-0072-5. "Pupillary reflex measurement predicts insufficient analgesia before endotracheal suctioning in critically ill patients" Paulus J, Roquilly A, Beloeil H, Théraud J, Asehnoune K, Lejus C.
This study aimed to evaluate the pupillary dilatation reflex (PDR) during a tetanic stimulation to predict insufficient analgesia before nociceptive stimulation in the intensive care unit (ICU). Crit Care. 2013 Jul 24;17(4):R161. doi: 10.1186/cc12840. "Reliability of standard pupillometry practice in neurocritical care: an observational, double-blinded study" Couret D, Boumaza D, Grisotto C, Triglia T, Pellegrini L, Ocquidant P, Bruder NJ, Velly LJ. In critical care units, pupil examination is an important clinical parameter for patient monitoring. Current practice is to use a penlight to observe the pupillary light reflex. The result seems to be a subjective measurement, with low precision and reproducibility. Several quantitative pupillometer devices are now available, although their use is primarily restricted to the research setting. To assess whether adoption of these technologies would benefit the clinic, we compared automated quantitative pupillometry with the standard clinical pupillary examination currently used for brain-injured patients. Crit Care. 2016 Mar 13;20:99. doi: 10.1186/s13054-016-1239-z. "Automated quantitative pupillometry for the prognostication of coma after cardiac arrest" Suys T, Bouzat P, Marques-Vidal P, Sala N, Payen JF, Rossetti AO, Oddo M.
Sedation and therapeutic hypothermia (TH) delay neurological responses and might reduce the accuracy of clinical examination to predict outcome after cardiac arrest (CA). We examined the accuracy of quantitative pupillary light reactivity (PLR), using an automated infrared pupillometry, to predict outcome of post-CA coma in comparison to standard PLR, EEG, and somato-sensory evoked potentials (SSEP). Neurocrit Care. 2014 Oct;21(2):300-8. doi: 10.1007/s12028-014-9981-z. "Comparison of the ToFscan™ acceleromyograph to TOF-Watch SX™: Influence of calibration" Colegrave N, Billard V, Motamed C, Bourgain JL. Quantitative neuromuscular monitoring is now widely recommended during anesthesia using neuromuscular blocking agents to prevent postoperative residual paralysis and its related complications. We compared the TOF-Watch SX™ accelerometer requiring initial calibration to the TOF-Scan™, a new accelerometer with a preset stimulation intensity of 50mA not necessitating calibration. Anaesth Crit Care Pain Med. 2016 Jun;35(3):223-7. doi: 10.1016/j.accpm.2016.01.003. Epub 2016 Feb 16. By submitting this form, I agree that the information entered will be used, exploited and processed to allow me to recontact myself in the context of the commercial relationship that arises from my inquiry. This site is intended only for healthcare professionals. The information within this site is about IDMED medical devices. By continuing your navigation on this site you confirm that you are a healthcare professional.